After the Christmas break kids of both cub & beaver packs returned to their regular Thursday evening activities… with just one exception; a new venue. After the Christmas break the kids of both cub & beaver packs returned to their regular Thursday evening activities… with just one exception; a new venue. 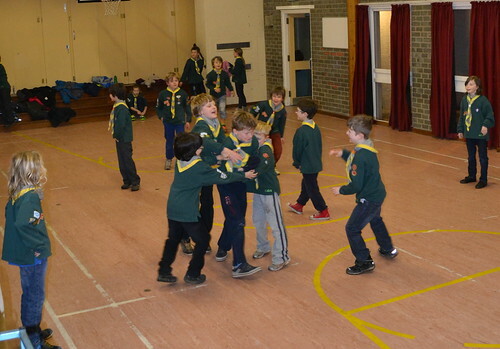 Following a year using Trevelyan Hall, the scouts have now moved to Pencaitland Primary School’s gym hall. Pencaitland Cubs are now based in Pencaitland Primary School Gym Hall for regular Thursday activities. Are you interested in having your child join the fun or even helping out yourself? Fill out the form below to join the Scouts in Pencaitland or, if you have problems viewing it, just click here. The latest intake of kids to the Beaver Scouts took place on Thursday the 5th December in Pencaitland’s Trevelyan Hall. If you don’t see all 18 photos below you can view them here. Since October 2012 Pencaitland has seen the return of both Cub and Beaver Scouts. Now plans are being made to launch Scouts for older kids. Pencaitland 1st Scouts aims to bring a Scout troop for 10 to 14 year olds to Pencaitland… but it needs adult helpers to make it a reality. Scouting is a great way for both boys and girls to learn a wide range of practical and inter-personal skills as they grow into young adults. Now with troupes for both six to eight year olds and eight to ten, the next phase is the launch of a full Scout troop for kids ranging from ten and a half up to 14 years of age. The Scout Troop forms the senior section of Scout Groups. Since 2003 it has been open to ten and a half to 14 year olds. This Troop is the longest running section within the UK organisation, although it was originally termed the Scout Patrol when the movement started back in 1907. Local organiser Ken McNight is keen to talk to any parents or other adult helpers willing or able to spare their time, however limited, to help bring this next stage of the Scouting movement back to the village. A meeting is planned for the 11th of December in the Winton Arms at 8pm in order to recruit a team of people keen to make this happen. It’s only through volunteers that have helped out to date that we already enjoy both Cubs and Beavers Scouts. Now it’s your chance to get all three local Scout sections based back in Pencaitland. Please come along on the 11th and help make this next step a reality. Don’t assume that someone else will step up and make it happen. Sadly that’s what contributed to the previous demise of Scouts in Pencaitland over ten years ago. Everyone who wants to help is very welcome and very much needed, and the more that help the easier it is and the less each person will need to do individually. If you can’t make it to the meeting on the 11th please contact Ken directly on his email at kenneth@commsworld.com. Pencaitland Scouts have been through exciting times with many new kids & volunteers since being revived in 2012. Can you help build on this great start? Pencaitland Scout Group has been through a very exciting period with increasing numbers of children and adult volunteers since being revived in 2012. The Scouts now need a Group Scout Leader (GSL). This is a volunteer manager role that is responsible for leading the Scout Group and ensuring that our youngsters get the best quality Scouting possible. The search is now on for a new GSL. Since the scouts returned to the village it’s become clear that there are some amazing people within and outside the Group and the Scout movement is keen to ensure that everyone gets the opportunity to nominate people they feel could take on this role and make that crucial difference. You are being invited to contribute to this search by submitting a nomination, (or nominations), of persons, including yourself, who you feel should be considered for this important and rewarding role. As well as considering those for nomination the Scouting movement is asking you to share this information with your contacts and encourage them to nominate candidates for this role. Self nominations are actively encouraged and expected. If you believe you can bring the right skills and expertise to the role and you are enthusiastic and motivated then why not nominate yourself? If you don’t, and are not nominated by someone else, you may miss out. To nominate others or yourself please complete this Nomination Form and either post or email it to Scott Burton. You can also contact Scott Burton, Local Development Officer for South East Scotland Scouts, or Liz Wilson, District Commissioner for East Lothian Scout District, to have an informal chat about the role and what it entails. It does not matter if the individual you want to nominate is new to Scouting. Scouting has a comprehensive adult training scheme which can provide training and support for anyone new to the role, enabling the individual to develop. What is important is for them to bring the leadership and skills that will continue to move the Pencaitland Scout Group from strength to strength. In the role of GSL you can make a real difference to local young people by working with a team of like-minded volunteers to deliver Scouting. You will be responsible for ensuring each adult has what they need to be confident in their role, whilst being able to fit the role around your availability – you don’t need to be down at the Group every week nor do any direct youth work! To get you up to speed you will have access to training relevant to the role and will receive an induction, as well as on-going support from the team at Scouts Scotland. The search will close on 29th November 2013 so please ensure your nomination is in in good time. Nominations will be reviewed by the search team and a shortlist drawn up for interview. If you are unsure or would like a non-committal chat about the role, or any nominations you wish to make, then please do contact either Scott or Liz to discuss further. The Courier featured a picture and short story in this week’s paper on last Sunday’s Litter Pick, which enjoyed the biggest turn-out to date. Click above for full story. It was touch & go but in the end the Sun shone down on Pencaitland’s army of litter pickers who scoured the streets & pathways for a record rubbish haul. Just some of the kids who helped make the 2013 Litter Pick a success with the pile of litter collected continuing to swell throughout a fine sunny afternoon. Click the photo for more pictures. With the recent hard to predict weather we have been encountering it was anyone’s guess as to how many would choose to venture out to spend a few hours helping clean up their community. In the end any doubts were quickly dispelled when around 60 kids turned up, either with family or with one of a number of community groups, including Cubs, Beavers, Rainbows, Pencaitland Youth Football Club and Guides. Then there was a strong cohort of parents and other adults along to help out making it a community-wide affair, covering all ages and backgrounds. The Community Council would like to say a huge thank you to all those who took part in today’s event. In addition to the usual well-trodden routes, with such a good turnout we were able to cover far more ground which resulted in a significant increase in the amount finally collected. It’s estimated that the volume of litter bagged is around double the amount retrieved at last year’s event. Many thanks also to Pencaitland Primary for putting together some fantastic posters publicising the event. Many many plastic and glass bottles and aluminium cans. As part of Winton House’s annual Spring Family Open Day, this year Pencaitland Scouts were out in force to help set up and participate in an assault course within the walled garden. One of the many kids (and a few grown ups) who leapt into action at this year’s Family Open Day in Winton House. Winton House threw its doors open for the annual Family Spring Open Day, with funds being raised for Maggie’s Centres, the Scottish cancer care charity, and Scotland’s Gardens. As well as the scout activities there was plenty of entertainment for families and children — from face painting and a bouncy castle to the Winton Combat Challenge, miniature hovercraft and more. There was also delicious homemade soup, sandwiches and cakes at Cafe Winton with the funds going to the supported causes. All those taking part in the Scouts’ Assault Course were asked to make a voluntary contribution to raise funds for Pencaitland’s new scout troupe which was only recently revived late last year after a seven year hiatus. Following the recent revival of Cubs in Pencaitland after a seven year hiatus, Beaver Scouts are also set to return this March. Beavers is open to kids roughly between the ages of 6 and 8 years of age. Click to fill in the form. A number of interested parents got together last year to begin planning the return of a scouts pack to Pencaitland. With Pencaitland’s Cub Scouts up and running since November last year, proving hugely popular amongst the first new intake of kids, it’s the turn of Beavers. Beaver Scouts are the youngest section of the Scouting family aimed at roughly six to eight year olds. Their activities are based around making things, outdoor activities, singing, playing games, going out on visits, investigating nature, listening to stories, learning how to be safe and most importantly, making new friends. You can find out more about Scouts by checking out the Parents FAQ. Following two recent meetings with officials from the scouting movement and interested parents, plans are taking shape to bring back the Scouts to Pencaitland after a seven year absence. Pencaitland used to be well served by the scouting movement for many years, with the local troupe being one of the first in Scotland to have girls join. Unfortunately, many of the parent helpers that made it possible moved on and, without new people to carry it on, the local scout group folded around 2005. Now, thanks to the efforts of parents keen to see it return, a small group has formed to bring it back once again. This time it’s being headed up by David Donohoe and Alison Mells with the support of parents keen to help make its return a success. But there are few guarantees without further support from parents who would like to see all three age groups eventually revived. Currently the plan is to have Cubs (eight to ten and half age group) return in late November, with the Trevelyan Hall providing a base for Cub meets each Thursday, roughly once a week during term times. Cubs is the second section of the Scouting movement, originally started in 1916 for younger brothers who wanted a ‘look-in’. In nearly a century, the section has constantly evolved and adapted its programme and methods to meet the changing needs of each generation of kids. Then, provided there are sufficient local helpers to work with David, Beavers (six to eight and a half age group) would begin sometime in the New Year, also using Trevelyan Hall. Beaver Scouts are the youngest section of the Scouting family. Their activities are based around making things, outdoor activities, singing, playing games, going out on visits, investigating nature, listening to stories, learning how to be safe and most importantly, making new friends. Eventually, if there proves to be enough local interest amongst parents, grandparents and other adult volunteers, the Scouts (ten and a half to fourteen age group) could be revived. Scouts are the third section of the Scouting movement. From the first experimental camp for 20 boys in 1907 there are now over 499,000 boys and girls involved in Scouting in the UK. Adult volunteers are critical in ensuring that our local young people are able to take part in their own big adventures as they grow into their early to mid teens. Following a recent meeting in Trevelyan Hall with a team from South East Scotland Scouts, a number of parents are keen to reintroduce scouting to Pencaitland. Come along to the meeting on the 23rd October at 8pm in the Winton Arms and help bring back scouting for kids of all ages to Pencaitland. The Trevelyan Hall meeting highlighted the fact that there are waiting lists in the surrounding towns and villages to join cubs, beavers and scout packs, most notably in nearby Tranent and Haddington. With this in mind Scott Burton, local development officer with the scouts for South East Scotland, was keen to encourage parents and other supportive adults keen to help, to try to restart scouting in Pencaitland which lapsed some seven years ago. Taking Scott’s lead, locals Alison Mells and David Donohoe are spearheading a follow-up meeting in The Winton Arms on the 23rd of October at 8pm. If you are keen to see cubs, beavers and scouts return to the village now is your chance to help make it happen. Please try and pop along on the 23rd and see how your help can bring back what was at one time a central part of village life. If you can’t make it to the meeting but would like to be kept informed, please email scouts@pencaitland.org with your name and contact details.